Did you know that Ralph’s Radio in Vancouver and Victoria can install aftermarket heated car seats in most vehicles? That’s right! Even if your car, truck or SUV didn’t come with seat heaters, our team of installation technicians can add high-quality, OEM-grade heating elements to almost any seat in your vehicle. Let’s look at how heated seats work to make a cold winter morning a lot more comfortable. Whether you have cloth, vinyl or leather seating surfaces, our seat heater kits will add warmth and comfort on a cold winter morning. Our seat heating kits are sold as a “per seat” solution and include upper and lower heating element pads, a control switch and of course, all the wiring we need to complete the installation. 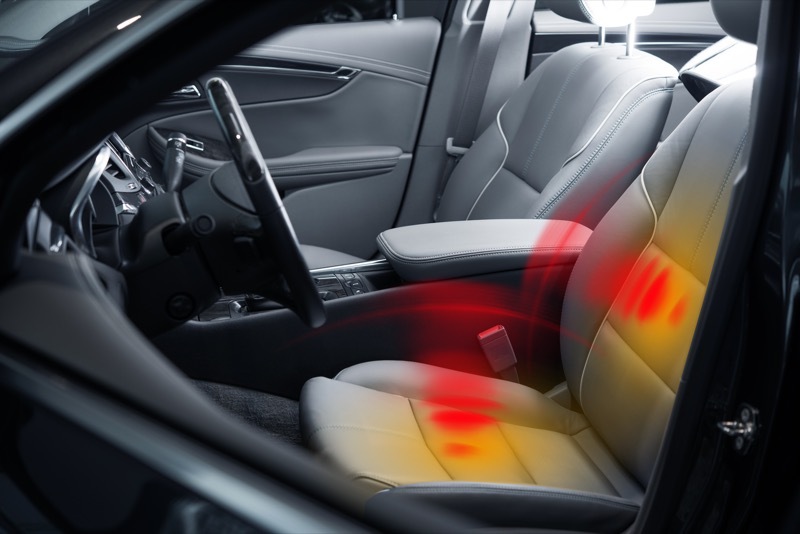 The heating pads are thin and flexible, and we install them between the upholstery and foam cushion of your seats. The pads feature flexible carbon fiber heating elements that provide even heating across the entire seating surface. The pads conform to the contours of the seat and are essentially undetectable once installed. Our product specialist and installers will work with you to choose an ideal location for mounting the control switches for your heated seats. In most applications, the switches offer high and low heat setting options to fine-tune the warmth to the weather or your preferences. The control switch is fully mechanical, so you can leave the seats in one of the on positions and they will start warming up as soon as you start the vehicle. This is a great feature for those with a remote car starter to make the vehicle comfortable and ready to drive. Many vehicles include pressure sensors or occupant detection systems in the passenger seat that control the passenger side airbag system. Our technicians can modify the heating elements to work around these sensors to keep all the vehicle safety systems functioning flawlessly and reliably. As important as the quality of components we install are, how they are installed is equally important to the reliability of the system. All of the wiring for our heated car seats is run along same paths as factory wiring to ensure everything is safe from damage. We solder all the electrical connections we make for maximum conductivity and reliability. Unlike taped or T-tapped connections, our process can handle vibrations, temperature changes and humidity variances that can wreak havoc with inferior installation methods. Our goal is to meet or exceed the standards set by automakers for all of our wiring so that your upgrade will function flawlessly for many years. If you are interested in adding heated seats to your vehicle, drop by Ralph’s Radio in Vancouver or Victoria and talk to one of our product specialists. They will inspect your vehicle and confirm that your upholstery is compatible with our seat heating solutions, then provide a detailed quote to complete the installation. If you want the ultimate in comfort, we can install a remote car starter at the same time to have your vehicle warmed up and ready to go on even the coldest winter morning. We invite you to give us a call or send an e-mail to schedule a personal consultation to find out how we can enhance the comfort of your vehicle this winter.